The naivete of a virginal student, the cheerfulness of a working-class Bavarian man, the hard-earned experience of an army lieutenant, the reluctant stoicism of of another infantry grunt – a wide gamut of personality traits and defense mechanisms, each pierced with equal disregard by steel-core bullets in G.W. 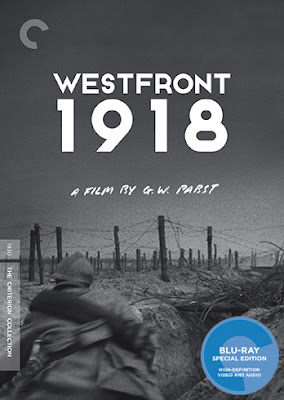 Pabst's grim World War I movie, “Westfront 1918” (1930). Pabst is best known today for his two silent Louise Brooks vehicles, “Pandora's Box” (1929) and “Diary of A Lost Girl” (1929), but most of his sound films aside from “The Threepenny Opera” (1931) remain largely overlooked. Criterion's twin releases this week, “Westfront 1918” and “Kameradschaft”(1931), prove that the great Austrian director made the transition to sound as smoothly as anyone. 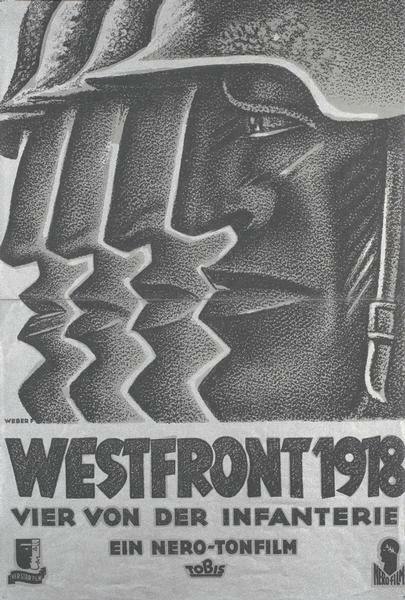 “Westfront 1918” begins with the battle away from the front lines, as a group of soldiers relentlessly paw at a young woman (“Mine next!”) who has a full-time job fending off their advances before finding her way into the arms of her young lover, the aforementioned student. Later, the film will focus on the desperate straits of the German citizens suffering from wartime shortages, including endless food lines and a soldier's wife forced into dire measures to pay the bills while her husband is at war. For all the attention lavished on the homefront, Pabst and screenwriter Ladislaus Vajda, adapting a novel by Ernst Johannsen, reach their heights when evoking the horrors of life and death in the trenches. Bravery is in no short supply, but it's defined not by grand heroic gestures, rather by the ability to endure the constant terror of slaughter, as likely to come from errant “friendly” fire as from the enemy hidden a few hundred yards away in the other trenches. Death can arrive from anywhere and at any time. A soldier reaches to test a small wound on his neck and just has time to exclaim “Well, I'll be” before pitching forward. A small group of terrified men try to prop up a crumbling wall in one of their makeshift shelters, as the very structure built to protect them now threatens to bury them alive. There is nowhere to hide, and there never will be. Like the best directors exploring the uncharted dimensions of sound cinema, Pabst doesn't pour on the sound design simply to simulate realism, but deploys sound selectively for specific expressive effects. The low whistle of an incoming shell is all the more frightening because of the relative silence it shatters. Pabst shot many scenes silently, layering in sound in post-production, freeing the camera to guide as fluidly as in his earlier films, though he also used synchronized sound in the few more dialogue-heavy sequences. 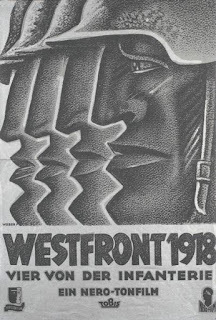 “Westfront 1918” generates much of its considerable power from the array of faces and bodies of all kinds documented by the camera, but never more so than during the hellscape that ends the movie, a makeshift hospital littered with the dead and dismembered, the living still unable to believe they no longer have legs or arms. The film's final note hardly inspires even the faintest shred of hope as a helpless man criesout for water. We fade-out before learning if anyone is left to hear him. The film is presented in its original 1.19:1 ratio, a narrower ratio employed in the early days of sound film. The original camera negative is lost, and this 2014 restoration by the Deutsche Kinemathek relies on a 35 mm duplicate positive held at BFI, and a 35 mm duplicate negative from Praesans-Film AG to replace shots missing from the positive print. Considering the extensive restoration necessary, this high-def transfer looks remarkably sharp and shows off a grainy depth with surprising detail even in some of the darker scenes. There are a few instances of damage visible, but the final product is quite impressive. The linear PCM mono audio track sounds a bit hollow but is otherwise clear and consistent throughout. Optional English subtitles support the German audio. The disc also includes an archival audio-only interview (1988, 3 min.) with the film's editor Jean Oser, who mostly discusses how his early approach to what later would come to be known as Foley sound work. We also get a new interview (2016, 18 min.) with film scholar Jan-Christopher Horak, director of the UCLA Film and Television Archive. He contrasts Pabst's film with Lewis Milestone's “All Quiet on the Western Front,” released at almost the same time, and then provides some fascinating details about the production of Pabst's film as well as about some of the cast members. Finally, the disc includes a Restoration Demonstration (9 min. ), featuring members of the team at Deutsche Kinemathek. I'm always riveted by this restoration featurettes and wish they were longer. The slim fold-out insert booklet features an essay by author and critic Luc Sante. Many viewers know Pabst past as a master of silent cinema, but his first sound film ranks comfortably among his very best. Criterion has provided a strong high-def transfer of this recently restored film along with a solid collection of extra features. Obviously, this release is strongly recommended.